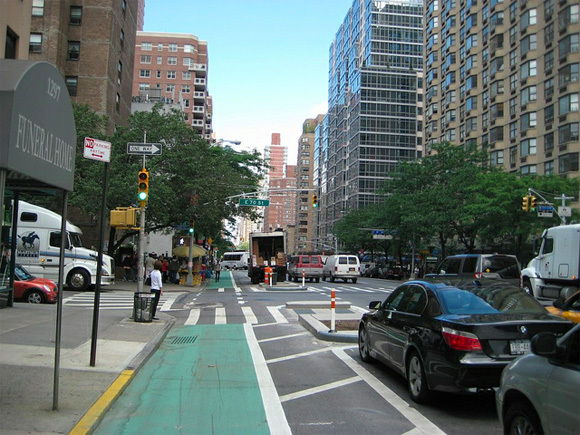 Photo contributor extraordinaire Jacob-uptown has uploaded a new batch to the Streetsblog Flickr pool, taking us on a tour of the major new bikeways DOT is implementing in Manhattan. There is a big gap between the sharrows on 1st Ave leading up to 57th, and the beginning of the protected lane on 61st. At 57th the sharrows simply end, with no indication that a much nicer facility is only a few blocks away. More photos from Jacob after the jump. The Eighth Avenue protected bike lane looks like it’s on the cusp of rideability. When it’s finished, it will open the west side of Midtown to safe, protected cycling for the first time. A southbound pair on Ninth Avenue is also in the works. This is huge. 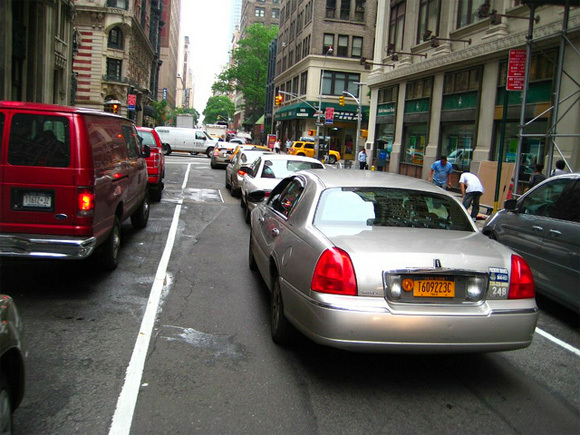 …this photo shows how the protection ends at 56th street, where the lane becomes a buffered bike lane for one block until 57th Street. At 57th Street, there is a bike box, where cyclists are supposed to cross to the east side of the street. 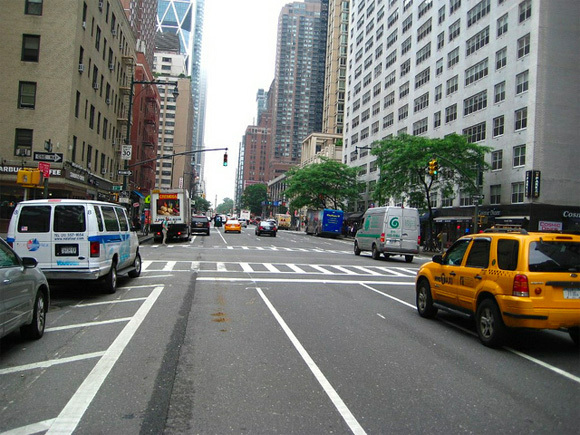 From 57th to Columbus Circle, it appears that there will be either a bike lane or sharrows. In Columbus Circle, there is a small section of buffered bike lane and little else guiding cyclists through. It is this type of weak connection between facilities that is DOT’s biggest weakness right now. While the overall project is very well designed, this section fails to meet the 8-80 standard and poses a major obstacle to less experienced cyclists. Sharrows definitely do not meet the 8-80 standard, but they have their place. For whatever reason, drivers actually show some repsect for sharrows, leaving a nice gap between parked cars and slow moving cars, where cyclists can easily get by. In this picture, the sharrows aren’t even finished, but they are pretty well respected. They look beautiful. Remember how only a few years back this was considered a radical, experimental design? Now it just makes sense. Let’s keep working with our Community Boards and the DOT to make things better all the time. Is there any word on when or if 2nd and 9th Avenues will be getting upgrades north of 34th like 1st and 8th? These are great, but there are no good southbound routes that extend for more than about 20 blocks. Broadway is a nice, but I think most cyclists try to avoid it because of the pedestrian congestion around Times Square and Herald Square and the fact that it stops at Union Square. What we need is NYPD enforcement of the sharrows in the cases where the driving scofflaws block sharrows, pass against them, or otherwise violate the rules regarding sharrows. Obviously that’s a pipe dream at this point, but it would go a long way to making sharrows feel like a substantial piece of bicycle infrastructure. It’s nice that 80% of drivers can pick up on the implied meaning of a symbol on the road, but let’s face it, it needs to be 100% or else it’s not entirely safe to use a sharrow lane. Also hate to be negative on this, but the end of the Eighth Avenue lane looks like an unintelligible mess. Let’s hope they’ll do some surveys after they fully install it, to see just how many people keep to the left or walk their Bike-N-Rolls 2 blocks to the park from there. I might be wrong, but the DOT has a not-very-good track record of making changes to most older designs where they were VERY wrong. @5888ab591f5c0b93652f7ef179f9e937:disqus 9th Ave is in progress right now, between 33rd & 47th. That section has been repaved and in the process of being restriped, but there isn’t much to see yet, except a newly surfaced street and a few vehicle lane markings. According to a DOT tweet, the restriping will include a protected bike lane. I have no idea, though, when the lane will be installed between 47th & 59th, but DOT indicated that it should be done by this fall. As for 2nd Ave, I don’t think there are any plans at the moment for a protected lane beween 68th and 34th, presumably because there is too much traffic. The last DOT presentation stated that a protected bike lane will be installed on 2nd Ave between 68th & 100th, when the 2nd Ave subway construction is completed, and the roadway is restored. That project is quite a long way off, though. 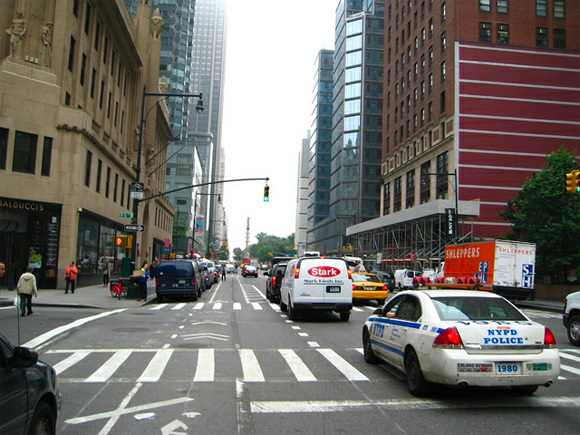 First and Second avenues are major truck routes in Manhattan. There are also many stores along those avenues with a high volume of truck deliveries. First ave is too crowded between the bike lane and the bus lane for safe truck use. The DOT can reduce the high truck traffic on these avenues by upgrading the FDR AND Harlem River Drive to accept truck traffic. This will save many lives of New Yorkers by making the avenues safer. 2ave . subway phase 1, which also created 39,000 new jobs . It’s a little difficult to make those truck deliveries from the FDR. I also just noticed suggestive paint markings on the 72nd transverse through Central Park!